Why are so many Christians gullible and brain dead? Why do they believe every crazy email they get and forward them? Why do they fall prey to every Republican scare tactic. Thankfully, I don't get much junk forwarded email. And thankfully most of the Christians I know are educated, wise, and thoughtful. Just to be a rebel I put the Muslim stamps on my Christmas cards. Ha ha. Although you'd never know. It's in the shape of a Christmas tree. Here's a pic. If there is only ONE thing you forward today... let it be this! 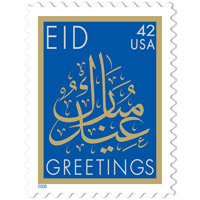 Now President Obama has directed the United States Postal Service to REMEMBER and HONOR the EID MUSLIM holiday season with a new commemorative 44 Cent First ClassHoliday Postage Stamp..
All you have to say is "No thank you, I do not want that Muslim Stamp on my letters!" REMEMBER the MUSLIM bombing of the Marine Barracks in Lebanon! REMEMBER the MUSLIM bombing of the military Barracks in Saudi Arabia! REMEMBER the MUSLIM bombing of the American Embassies in Africa! REMEMBER the MUSLIM attack on 9/11/2001! Pass this along to every Patriotic AMERICAN that you know and let's get the word out! hmmmm I am thinking about this type of thing more and more. I wonder what a Muslim family would feel if they received this type of email in their inbox. Not all Muslims bombed the world trade center, hijacked airliners, etc... nor did most Muslims endorse those actions. I don't think that we should associate all Muslim men and women with the acts of a few, any more than we should associate all Christians with Westboro Baptist and their abhorrent actions. The goal of everything that we say and do should be to promote the Gospel of Jesus. I'm not seeing much promotion of Jesus in forwarding boycotting Muslim stamps. In fact I think the opposite is being accomplished. I have seen Christmas and Chanakkuah and Kwanza and even solstice stamps at the post office for years. Why shouldn't we have a Rammadin stamp? Should the sins of a few in that religion be something that means they aren't allowed to have the same priviladges as the other religions in this country? I'm just really searching myself on this subject. Wondering how to walk the fine line between being patriotic, remembering that we are at war with only the extremist people of a religion not just a country, and also remember that we are at the same time to love all people to share the gospel of Christ. I'm trying to figure out for myself how this type of thing is promoting the Gospel of Christ.